My husband was a poet who loved words as well as visual images. I attribute his lifelong interest to the wonderful liberal arts education at Occidental College including the various criticism classes he took in art, drama, and literature. On weekends, we went on interesting dates - often to Hollywood to curious bookshops or coffee houses to hear beat poets. One Saturday, we visited Immaculate Heart College in Los Angeles for a sale of lithographs by the students of art professor, Sister Mary Corita. The sale included some of the teacher's pieces. 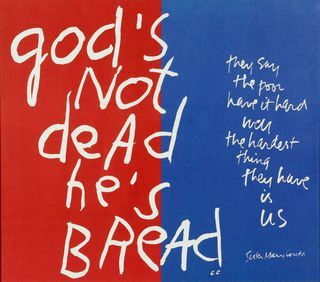 Corita Kent was a pop artist who saw the sacred in everyday words and images. She produced large, colorful graphics filled with words and phrases about her faith. A large portrait of Wonder Bread, for instance, would convey a sense of wonder about God. Her art portrayed the messages of love and peace during the 60s and 70s -- a time of social upheaval. Sister Corita designed the 1985 Love stamp for the US Postal Service. She sold well, and fortunately, the art that Corita was discarding the day we visited the sale was affordable. I fell in love with her creations during that visit to the college and still have about fifteen lithographs that we collected over the years. I recently donated a few back to the Corita Art Center as they keep a collection of her works, and they were missing some of those early pieces that she had discarded. Corita taught me to look at the universe in new ways. She saw the sacred everywhere she looked. She saw it in nature, in products in the marketplace and in everyday objects at home. We bought a large lithograph of the Los Angeles Times that screamed out the gospel in the daily news. She taught me to see God in everything that touched me, everything around me, everything within me. She taught me to look for the sacred in others. It fit for me - all God created is good - and it is we humans that often mess it up out of ignorance or self interest.